Maria Sharapova will premiere her new own line of racquet bag at Wimbledon. "In-line with the tradition of wearing white at the All England Lawn Tennis Club, Maria will premiere her new white HEAD Tennis Racquet Court Bag on the grass courts at the Wimbledon Grand Slam", says HEAD Tennis in a press-release. The brand, together with Maria, designed a "new bag series to satisfy women’s needs for functionality and style on the tennis court". This is the second edition of the HEAD Maria Sharapova Tennis Racquet Bag collection, which will come in white and gold colouring. The new bags will hit the stores at the end of August, right in time for the US Open. 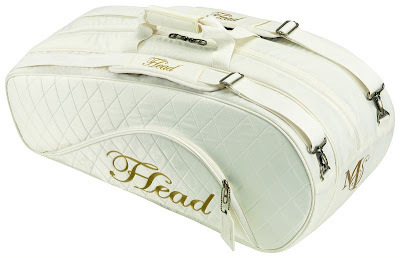 Fans of HEAD Tennis on Facebook will then have the chance to win a special version of the bag, signed by Maria, says the brand in a statement released on Thurday.